Nightmares from the Deep: Davy Jones is rated 4.4 out of 5 by 19. Rated 5 out of 5 by bailey10 from Fun Fun Fun! The storyline, the voice overs, awesome!!! I had so much fun playing this game! I re played the game twice to find all of the hidden objects and challenges. The voice overs made me think of Pirates of the Carribean, my favorite ride! Thank you for this one BigFish! Rated 5 out of 5 by JustTheFacts from Mum Walks The Plank! BASED ON COMPLETED GAME FIRST IMPRESSIONS Delightful! We are immediately immersed in the continuing story of Davy Jones and the woman who has been determined to dig up the evidence of his existence as a true historical figure. It is her presentation on the subject that Davy Jones himself interrupts in typically overwhelming fashion. The early cut scenes are splendid! I started to get vertigo, swooping like that! If you’ve not played the previous Nightmares Of The Deep games, you’ll have no reason to know why this particular woman is making this particular speech, but it matters not at all. Our battle with Davy this time is direct and immediate. Of course, if you have played those games, you’ll know this is not the first time we have interfered in Davy’s business. SIGHTS & SOUNDS Amazing colours, sounds and special effects characterise this game. I love how colourful everything is, despite the darkness of many locations. Sea urchins that are almost iridescent. Glowing seahorses. Flowers of such rich and vibrant shades you’d never be able to name them all. Heck, even the skeletons looked cute! And very clearly detailed HOP scenes. Which is important because some of the scenes are quite dark. The music is wonderfully ominous and foreboding. Mostly quiet, it is subtle and often consists of single, wide-spaced notes. There is a piano track that is particularly nice. The background noises are what you’d expect, wind and rain, sounds of the waves and the creaking of wood when on board. The voiceovers are tremendous, very appropriate, excellent acting, and lip synched! WHAT’S HAPPENING? We are the museum’s expert on Davy Jones, a reputation earned in the first two Nightmares of the Deep games, through our adventures. Still, no one living has set eyes on him, and many still say he is mere myth and legend. You are about to make your speech, in which you present the evidence of his historical existence, when what do you know?! The legend himself arrives in a high dudgeon, demanding that we keep silent about his personal business. Guess that is a pretty persuasive piece of evidence for our theory! Unfortunately, our “theory” kidnaps us (and our daughter), throws us in the brig, and starts for home. Despite an ingenious escape, we are soon recaptured and Davy Jones tricks our daughter into signing the fateful pact, like thousands of others before her, and now she cannot escape him unless the contract is fulfilled. But even Davy has long since forgotten what it was that fulfilled the contract! We learn the somewhat confused and confusing story of David Jones’ good luck and dire curses through the means of ancient “guardians of Davy’s memories”. What they will reveal to you, through a sepia toned cartoon, is the true reason for the rampage and evil that Davy has wrought across the centuries. This gets more convoluted as the game progresses and I wish it had been better told. GAMEPLAY Plenty of variety here. There are several types of HOP, including progressive silhouettes, interactive word lists, and fragmented object searches. Some scenes are visited twice, but using a different search pattern. Also, there is a straightforward mahjong game that you can use as an alternative. The mahjong annoyed me a bit, because in order to get the last item on the list, you had to find the golden pair of tiles that are chained up until all other tiles are used. That would be fine, except, if you swap partway through the list, you must start from the first tiles. Consequently, you really can’t, from an efficiency point of view, find that last object that is always the hardest to find. You know the one I mean, there’s always one. There are a bunch of mini-games and puzzles. They range in difficulty from delightfully easy to frustratingly hard. I was unhappy that I had to skip a couple of them, because I just couldn’t make head nor tail of them The adventure component is the focus of the gameplay, and I had a lot of fun with it. You have an interactive jump map, a directional hint, a journal I found basically useless, and a task list. COMBINED IMPACT I loved this game. The colours and the characters in particular impressed me. This is my favourite of all the Nightmares of the Deep games. Although, you couldn’t go wrong with any or all of them. Rated 5 out of 5 by pennmom36 from Salty Sea Devil The Sea Devil, Davy Jones has returned, riding a giant tidal wave into the museum and hauling you and Cory back to his ship. You escape the brig only to be captured on deck by a bunch of skeleton pirates and here comes Davy Jones again. Unfortunately Cory is tricked into signing a pact and now we're on a rescue mission. After being thrown overboard you manage to make it to shore where the biggest treasure known to mankind is buried. You've been told by pirates who have signed the pact as well that there is no way off the island until your pact has been fulfilled, but then you find a glimmer of hope. You find one of the 12 guardians of Davy Jones memory, there is a way to break the pact, but he doesn't remember, perhaps the other 11 will! Now I will admit that I'm a fan of the Collectors Edition because I happen to love collectibles and morphs, but for the Standard Edition price this is a great value if you can do without the bells and whistles. The graphics are bright and vibrant and there's a ton of skeleton pirates and even a ghost, the cinematics are very professional. 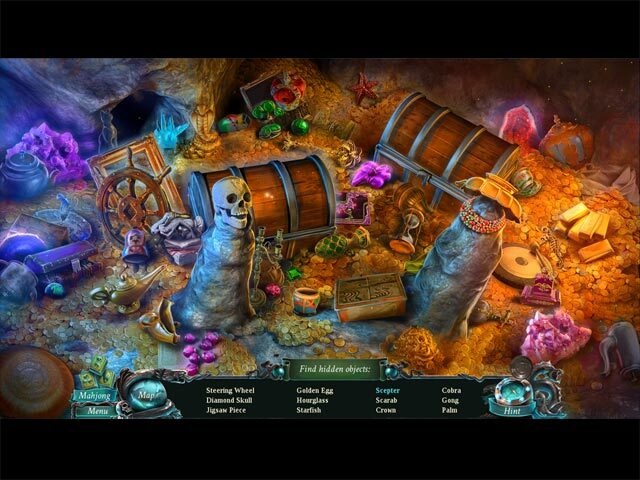 There are a mixture of hidden object scenes from interactive list finds, fragmented objects and progressive interactive scenes with mini games built in. You can opt for a nautical themed game of Mahjong as well. There are a bunch of unusual mini games that I haven't seen done before. My favorite one was talking to a pirate first mate's head where he agrees to help you if you get rid of the pirate skulls annoying him directly below him. To accomplish this you must exchange their hats to start a chain reaction of cannons firing, gems directing beams, lightning etc. until all pirated are destroyed and the entire time the first mate is cheering you on. This entire series is so entertaining that it's hard to stop playing so if you have the time, start with the first Nightmares from the Deep and enjoy! Rated 4 out of 5 by Rambo44 from Fun Hidden Object Game The game was alright to play but it seems like forever to complete it. Rated 4 out of 5 by swingers from good H.O.G Not all people go for this sort of game but I like the Davy Jones hog. Have enjoyed playing the last couple of the davy jones games and I am sure I will enjoy this one. Rated 4 out of 5 by rosekaufmann from APPEALING Follow the legend of Davy Jones in this visually-appealing production. Help free the signers of a Davy Jones past. Voice overs sound realistic with the proper amount of emotion. Graphics and use of color palettes are outstanding. Story and frequent cutscenes are well-developed. Good ratio of puzzles to HOS. Several types of interactive HOS. 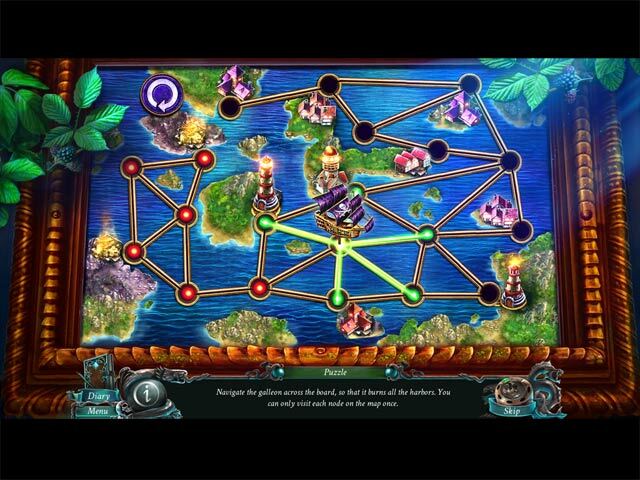 Puzzles are fun and interesting, but are relatively easy to complete; they could be more challenging. Objects are found close to where they will be used. Gameplay is straightforward. Although not strictly linear, it is a simple matter of logic to figure out what to do and where to go next. With all the attention to detail, it is an entertaining game. 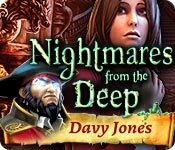 Rated 3 out of 5 by slm1022 from Nightmares from the deep: Davy Jones This is a rerun so it shouldn't be full price. Rated 2 out of 5 by swampie from GOING WITH GRANNIE ON THIS ONE Good-looking game. Nothing else of note. Rated 1 out of 5 by nontechiegrannie from This Nightmare Should Have Stayed in the Deep!!! Based on Demo: Another DREADFUL rehashed game given 5 Stars. I just don't understand the logic behind all of these supposed 5 Star games. The Devs/BF definitely need to go back to the drawing board. The games that are being churned out are simply dreadful. Doesn't anyone have any fresh/original ideas out there? The color/graphics are HIDEOUS. I thought I was looking at a cartoon & not a very good one at that. The characters are ugly & the daughter was just standing around, with her arms crossed, in the first couple of scenes. I found this to be very strange/off putting. Wasn't real fond of Davy Jones skeleton mask either. VO were the usual but nothing special. Same old HOG & I found the mini-games to be simple/childish. Nothing to stimulate the old gray cells. Usual back/forth & up/down scenes. Suppose I should say something nice. So here goes. The hint button filled nicely & the puppy was oh so cute!!! 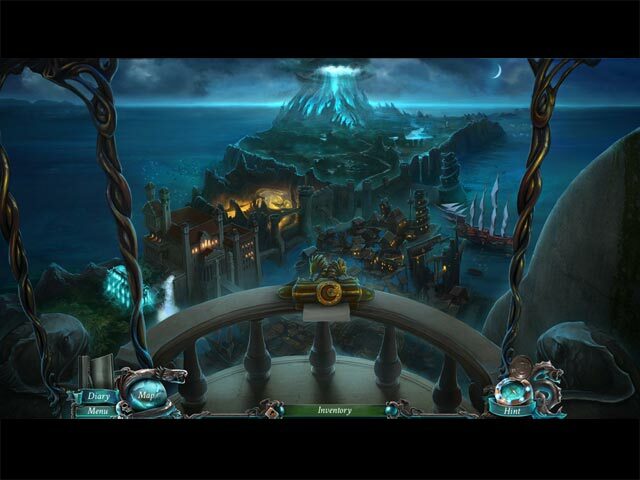 Escape the cold incarceration of Davy Jones' brig and discover the otherworldly origins of his galleon in this thrilling Hidden Object adventure!